My name is Matt Winick, an Asian American from Ann Arbor, Michigan and I have a strong interest in learning history, diversity, and social justice. In these subjects or core values, I like to learn the importance of the need for Civil Rights to be stronger to reduce discrimination, have diversity in society to help accept people who are different or come from a different background, and a strong need for education reform to make learning a better tool. President Sakaki, the main reason I’m writing you a letter is to explain how I find your work as 7th President of Sonoma State University to be very inspiring to me. In July 2016, I was amazed on how you made history by becoming the first Asian American woman to become President of Sonoma State University. 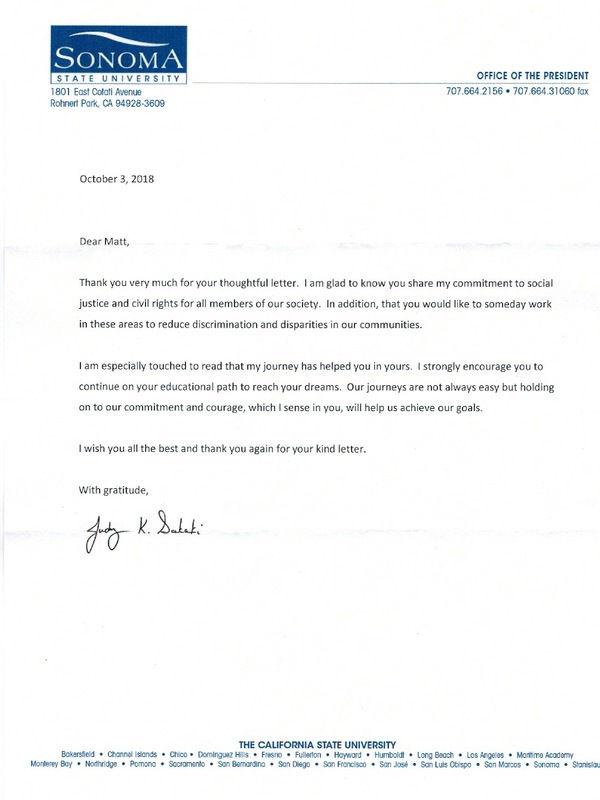 In your current role as President od Sonoma State University, I truly appreciate on how you are a strong supporter along with an advocate for Civil Rights by advocating for people with disabilities’ rights, working to improve Sonoma State University to help reduce discrimination to help protect minorities, women, and people with disabilities, and expand on programs to help educate people about the need to reduce hate-crimes. Provide students with disabilities with accommodations like extra time on exams or use educational software to help improve comprehension, expand more tutoring services to allow students to get help on their assignments from tutors, and push for more Liberal Arts classes (history, diversity, arts, humanities, and some basic classes) to make education diverse is common sense. Another thing that I like about your work as President of Sonoma State University is how you hire women, minorities, and people with disabilities to work for the college, support undocumented students including immigrants to get help on dealing with tuition in order to provide education, and team up with law enforcement services to improve resources to help victims of sexual violence or abuse on dealing with trauma, and work with student organizations to help improve the college environment including diversity. Besides your work as President of Sonoma State University, I really like on how you use your role as an Asian American to help the Asian American community by advocating for Asian Americans with disabilities’ rights, co-chairing a task force to award honorary degrees to Japanese American University of California students who were not able to complete their degree due to being interned in camps, teaming up Asian American organizations to help spread awareness about Asian American culture or education. Also I like on how you are a strong advocate for the need for immigration reform to help protect immigrants, refugees, and dreamers from being oppressed and to give them opportunities. President Sakaki, I have autism with a learning disability. Having a disability is hard for me because I have trouble comprehending on learning different advance subjects, sometimes I struggle to communicate my thoughts, and get teased. Your advocacy and support for Civil Rights including people with disabilities’ rights really inspires me to work hard on my disability. Also being an Asian American with a disability is hard for me because some Asians including some Asian Americans tease me or get judgmental about me being different and not meeting their standards. Your role as President of Sonoma State University gives me motivation to continue to learn history, social justice, and diversity. My future goal is to someday work in these areas to help emphasize the need for Civil Rights to be stronger to reduce discrimination, have diversity to help accept people who are different or who come from different background, the need for immigration reform to help protect immigrants including refugees from being oppressed, a strong need for education reform to improve learning, and many others. I strongly believe that you are making a great difference for education and society. I really proud on how you work hard to improve education, support with advocate for Civil Rights, push for diversity, and help the Asian American community. You have inspire me to work hard on my disability, be confident about being an Asian American when I have struggles with a disability, and be motivated to learn history, social justice, and diversity. Thanks for taking the time to read my letter, working hard to improve society, and inspiring me. I wish you the best to continue to make a great difference for society.